ZOMBA, Malawi, August 24, 2012 (ENS) – Malawi’s Lake Chilwa could dry up completely in 2013 or 2014, scientists warn. The prediction has created fears of hunger and economic ruin among the more than one million people in fishing and farming communities around the lake. 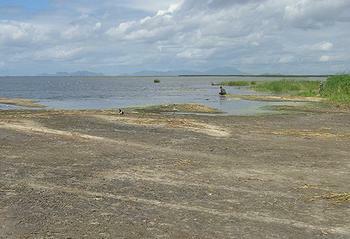 The drying of Lake Chilwa is a national food security concern. 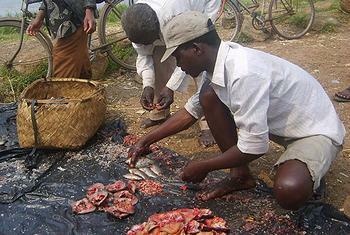 The basin is a rice growing area, and fish from the lake provide a source of nutritious protein to many rural Malawians. Located on Malawi’s eastern border with Mozambique, Lake Chilwa is 60 kilometers long and 40 km wide (40 miles long by 25 wide). Surrounded by extensive wetlands of international importance protected under the Ramsar Convention, the lake seasonally hosts migratory birds that fly from the Northern Hemisphere seeking to breed and escape winter’s harsh cold. Lake Chilwa is driven by cyclic changes in water levels which are mainly influenced by annual rainfall patterns. Scientists say the fluctuating rainfall patterns and changes in lake levels are influenced by accelerated environmental degradation taking place in the catchment area that spans three districts – Machinga, Phalombe and Zomba. The current drying forecast is based on rainfall readings collected by the weather station at Chancellor College, the main constituent college of the University of Malawi. During the 2011-2012 season, the total rainfall recorded was 1048 millimeters (41.2 inches) in 2011 and 655mm (25.7 inches) through June 2012, says Daniel Jamu, a senior scientist at Malawi’s World Fish Centre. Similar rainfall patterns were recorded in the 1994-1995 season when the lake lost all its water. The total annual rainfall recorded then for the two consecutive years was 775 millimeters (30 inches) and 748mm (29.4 inches). The Lake Chilwa Basin Climate Change Adaptation Programme, LCBCCAP, re-established lake level and river discharge monitoring in the basin in 2010 after a 15-year break. LCBCCAP is a joint program funded by the government of Norway and executed by the World Fish Centre, the Forestry Research Institute of Malawi and the think tank Leadership for Environment and Development in Southern and Eastern Africa, LEAD. Lake level observations and monitoring are conducted by communities in collaboration with district water offices. These measurements corroborate the Chancellor College rainfall readings. Professor Sosten Chiotha, LEAD regional director, agreed with Dr. Jamu that the rainfall readings collected at Chancellor College meteorological station, plus the history of a rainfall pattern lower than 1000mm for two consecutive years, has resulted in the complete drying of the lake in the past. Chirwa said Lake Chilwa’s economic values exceed US$21 million annually and that lake contributes 20 percent of all the fish caught in Malawi. At Kachulu Harbour the lake level gauge has already dropped below 2.1 meters (82.6 inches). In some areas the gauge is very close to the bottom of the lake, increasing fears that the lake is likely to dry up. A representative of the Traditional Authority of Kuntumanji, one of eight traditional authorities in the Lake Chilwa catchment basin, expressed worry that the predicted drying will cause economic and nutritional hardship for local communities. John Wilson, an ornithologist who has long studied birds in the Chilwa wetland, recalled how when the wetland dried in 1973, catfish had to take refuge in water pools, while tilapia fish had to migrate upstream to rivers that flow into the lake. Several fishermen expressed worry about the decreasing water levels. Wilson urged local communities to take control of the management of the pools so that fish can seek shelter there. However, Andrew Daudi, head of the United Nations Millennium Villages Project in Malawi, had a different take on the situation. “Even if the lake dries the land could be put to good use through farming and and road construction. Certain insects that attack crops would disappear once that lake dries up,” he said. His comments attracted a host of reactions from people with dissenting views who said the lake is of great importance to the livelihoods of local people. Kamperewera suggested exploring avenues such as rainwater harvesting and developing a management authority so that agricultural development projects taking place in the catchment area would adhere to the plan. In this way, Kamperewera said, conservation of the Lake Chilwa watershed could become a priority.